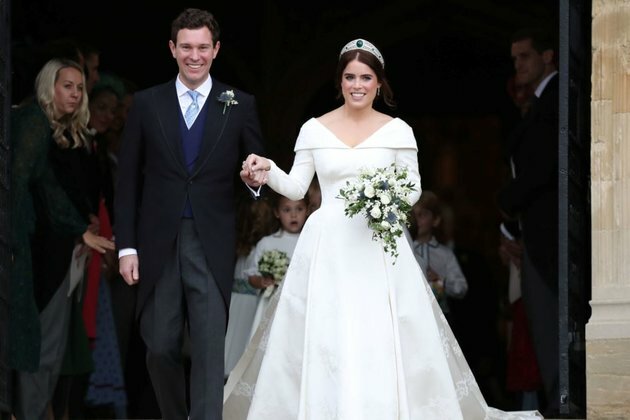 WINDSOR, ENGLAND - Queen Elizabeth's granddaughter Princess Eugenie married Jack Brooksbank at Windsor Castle on Friday in front of celebrities and Britain's senior royals including Prince Harry and wife Meghan who wed at the same venue in May. Morning' which broadcast the event live. Princess Beatrice of York and Sarah, Duchess of York arrive at the wedding of Princess Eugenie to Jack Brooksbank at St George's Chapel in Windsor Castle, Britain, Oct.12, 2018. Britain's Princess Eugenie of York and her husband Jack Brooksbank travel in the Scottish State Coach at the start of their carriage procession following their wedding at St George's Chapel, Windsor Castle in Windsor, Britain, Oct. 12, 2018. After the service, the couple made an open-top carriage tour of Windsor. The queen then hosted a reception at the castle.